The Pokes finally got a win — and a good one, at that. The Pokes aren’t dead yet. 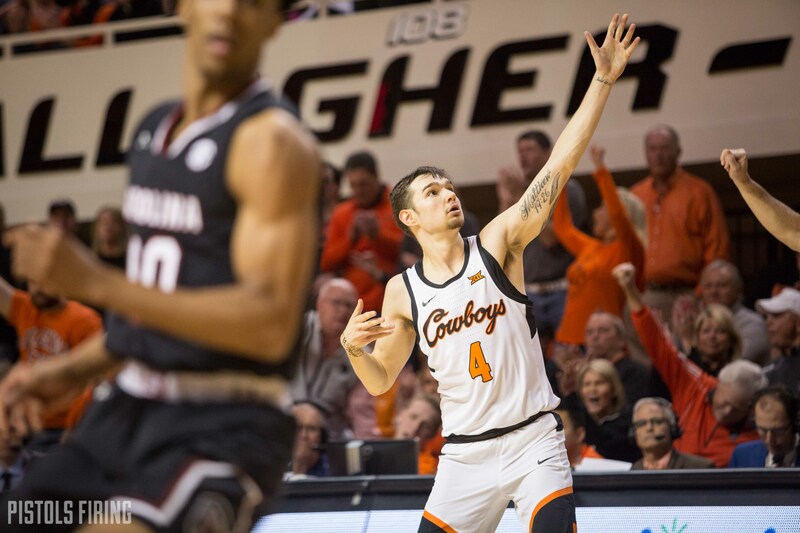 The Oklahoma State basketball team defeated SEC/Big 12 Challenge opponent South Carolina 74-70 on Saturday afternoon in Gallagher-Iba Arena. The OSU win ended a three-game losing streak and put a halt to the Gamecocks’ 6-1 tear. Here are some thoughts from the Cowboys’ ninth win of the year. Cameron McGriff was an absolute terror at the top of Mike Boynton’s 1-3-1 zone. Usually in zone defenses, coaches have their bigger guys at the back to defend the goal, but McGriff was able to use his size and athleticism to disrupt a lot of South Carolina’s offensive sets. McGriff ended the afternoon with three dunks. It started with this play, as he was able to tip a cross court pass away. Then came the play that will make all the highlight reels. With McGriff at the top of the zone, that left Isaac Likekele at the bottom. Likekele was able to use his ridiculous wingspan to intercept an oop attempt before threading a nice pass to a running McGriff for the poster. Not all of McGriff’s defensive havoc ended in flashy dunks. Here is a play where McGriff used his length against 6-foot-2 Hassani Gravett. McGriff tipped Gravett’s pass, took an elbow to the head and was at the free-throw line before Gravett got up. I don’t think anyone has told McGriff he is a robot, yet. The Cowboys have struggled forcing turnovers in recent games because of fear of foul trouble. Iowa State and Oklahoma turned the ball over only six times each in the Cowboys’ past two games. OSU forced South Carolina into 11 turnovers Saturday. Teams will obviously put a lot more prep into going against a 1-3-1 before playing OSU moving forward, so it will be interesting to see if the defense continues to work when teams are more ready for it. Mike Boynton mentioned to the media on Friday that he has put some extra thought into being more liberal with his timeouts to get his guys a some extra breath. Boynton took only one timeout in the first half, but he also let one go early in the second and late in the game to go with all of the media timeouts. Cameron McGriff also got an extra 10 minutes rest Saturday after playing all of Wednesday’s game. McGriff picked up two early fouls in the game’s first 10 minutes. He sat from 11:41 left in the first half until 7:39. In that time, while using Duncan Demuth and walk-on Luke Major for a stretch, the Pokes were able to go plus-4. 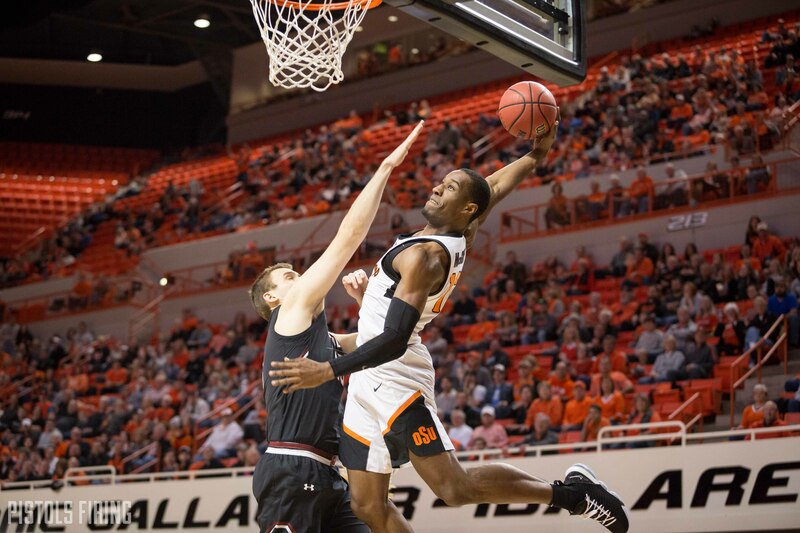 Thomas Dziagwa played a game-high 37 minutes, and all of OSU’s starters played at least, 30, but the breakdown that happened Wednesday night against Oklahoma never came. Some of that is probably playing the zone more defensively and some of it is probably the player’s bodies getting more used to it. Apart from Lindy Waters, there isn’t too much water around Stillwater, Oklahoma, but that didn’t stop Waters from dubbing he and Thomas Dziagwa OSU’s splash brothers postgame. Waters and Dziagwa were a combined 8-for-16 from 3-point land and 36 points Saturday afternoon. Dziagwa tied a career-high with 19 points and sent five imaginary arrows into the GIA crowd. Waters put in 17 points. He has scored in double figures in his past four games. “We were bad,” South Carolina coach Frank Martin said. “Scouting report says that (Lindy Waters is) going to shoot 3s from everywhere, so whenever we’re in the zone don’t let him shoot the 3s. How many times did we stand there and watch him shoot? That kid never misses. OSU freshman center Yor Anei was given quite the task of dealing with South Carolina big men Chris Silva and Felipe Haase, but Anei played one of his better games of his young career. Playing a career-high 35 minutes, Anei finished with a game-high plus-18, eight points, 11 rebounds and three blocks. Anei was smack in the middle of Boynton’s 1-3-1, and he too caused havoc with his 6-foot-10 frame and crazy long wingspan to boot. Just ask South Carolina forward Keyshawn Bryant. During #okstate's practice yesterday, Thomas Dziagwa told Yor Anei that today's game would be a physical one. Apart from Thomas Dziagwa and Lindy Waters, the Cowboys were 1-for-11 from 3, the one coming from Curtis Jones who was 1-for-7. That left the Cowboys a 38.2-percent, 3-point-shooting team coming into the game at 33.3 percent Saturday. As mentioned above, it was a particularly rough night from deep for Jones, who entered the contest shooting 32 percent from deep as opposed to the 14 percent he shot Saturday. Cam McGriff also missed a few open looks, finishing 0-for-3 from deep. Boynton has said one of this team’s offensive strengths is its 3-point shooting ability, so if there is a game where everybody can get it going at once, look out.